Home > Special Articles > Sustainability - Integrating Traditional and Modern Architecture..! Sustainability - Integrating Traditional and Modern Architecture..! The built environment of any community is considered to be the reflection of regional architecture – and thereby a significant component of differentiation. In the pre-Industrial Revolution phase, India’s built environment, as in the rest of the world, was shaped by certain values and cultural beliefs. However, with tremendous urbanization and globalization after the Industrial Revolution, India’s rich cultural and architectural heritage is vanishing. This is primarily due to increased usage of industrially-produced and standardized materials. With that, the dependency on locally-available materials has declined, transforming ‘vernacular architecture’ buildings to more standardized modern concrete structures. 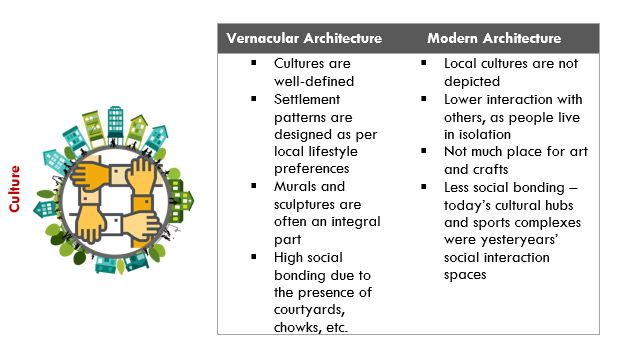 Vernacular architecture refers to structures built indigenously to a specific time or place, taking into consideration the experience of centuries of community building. It depicts the characteristics of the local environment, technology and climatic conditions. Importantly, buildings constructed through traditional techniques using natural, locally-sourced, non-toxic, renewable and biodegradable materials can also minimize negative ecological impacts. Modern architecture, on the other hand, uses industrially-produced materials (such as steel and concrete) that possess a low thermal resistance and require high energy intensity, thereby causing a considerable impact on the environment due to substantial energy consumption. 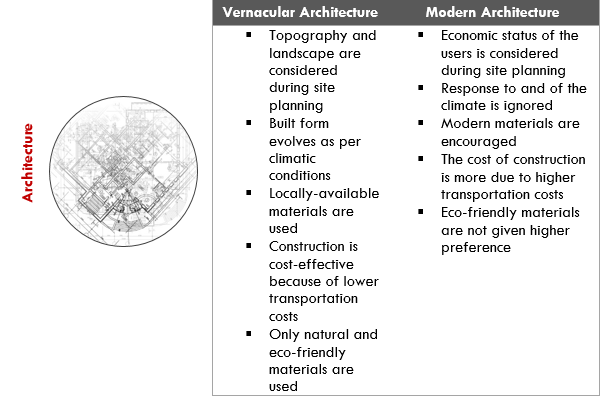 Modern structures consume around 10-15% more energy compared to vernacular ones. With the escalating ecological crisis across the world, there is a mounting threat to traditional and cultural values. Unplanned development that disregards local beliefs, culture and values has led to a widespread socio-economic imbalance. To make our communities more sustainable, vernacular elements need to be incorporated into contemporary town or city planning. Various initiatives are being taken by Earth Summit, National Habitat Mission, JNNURM, Water mission and Energy Efficiency mission to create culturally supportive communities. After all, vernacular traditions enhance not only social inclusion but also citizens’ quality of life. Already, we are seeing an increasing focus on harvesting rainwater, and preserving and promoting recycling and reuse. However, despite the challenges such as the provision of the built fabric in relation to the surrounding urban form, emphasis must also be given on building structures in response to the respective climatic conditions - structures which are energy-efficient and use natural, renewable materials such as mud and timber.